As Sumatran rhino’s numbers continue to decrease and head towards extinction, the race is on to find a breeding pair to start their long-term preservation. They have been trying, but no luck so far. Three years ago on the island of Borneo they found a suitable male rhino, but had a hard time finding a mate since there fewer than forty of the animals remaining. But now a young female rhino has been found and hopes are high that she can save her species. She will be mating with the male Sumatran rhino, named Tam, who was captured in 2008 in Malaysia. They have just been waiting for the right female to create a successful captive rhino breeding program. They had one, but she was too old to produce offspring. 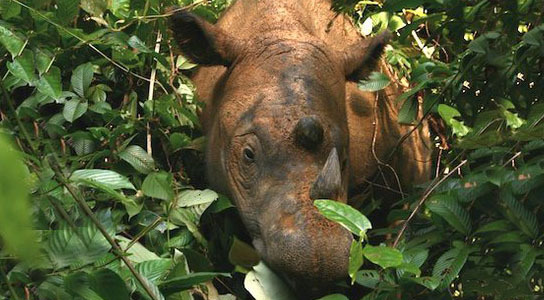 The young female Sumatran rhino, named Puntung, may be the savior. There are so few remaining in the wild that no other rhino had been observed near Puntung in years. We don’t yet know her age, but hopes are high that she can save the day. Be the first to comment on "Female Sumatran Rhino May Be The Key to Saving The Species"